Eileen Heckart (March 29, 1919 – December 31, 2001) was an American actress of film, stage, and television. Primarily known as a character actress, her career spanned nearly 60 years. She first became known for her role as schoolteacher Rosemary Sydney in the original 1953 cast of William Inge's play Picnic on Broadway. She won an Academy Award for Best Supporting Actress for her performance as the overprotective mother of a blind adult son in Butterflies Are Free (1972), a role she originated on Broadway before playing it in the film. 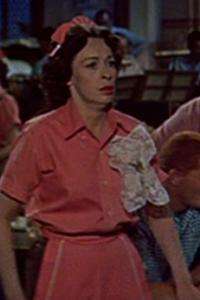 She often played mothers, including Rocky Graziano's mother in Somebody Up There Likes Me (1956); the mother of a murdered child in The Bad Seed (1956); the elderly mother of an estranged son in the PBS production of the one-act play Save Me a Place at Forest Lawn (1966); the mother of reporter Jack Stein on the 1990s television sitcom Love & War; the mother of two separate characters on the daytime soap opera One Life to Live in the 1980s and 1990s; and the meddling mother of a jilted wife (played by Diane Keaton) in The First Wives Club (1996), her last film role. She also had a recurring role on the popular 1970s sitcom The Mary Tyler Moore Show as Mary's Aunt Flo Meredith, a famous woman reporter, which she repeated on the subsequent spin-off series, Lou Grant. Heckart was born Anna Eileen Herbert in Columbus, Ohio, the daughter of Esther Stark, who wed Leo Herbert (not the child's father) at her own mother's insistence so her child would not be born with the stigma of illegitimacy. The child was soon after legally adopted by her maternal grandmother's wealthy second husband, J.W. Heckart, the surname by which she would be known her entire life. She had two stepsisters, Anne and Marilyn. She graduated from Ohio State University with a B.A. in drama. Heckart won the Academy Award for Best Supporting Actress for her work in the 1972 movie adaptation of Butterflies Are Free and was nominated in 1956 for her performance as the bereaved, besotted Mrs. Daigle in The Bad Seed, both of which were roles Heckart had originated on Broadway. She also appeared as a Vietnam War widow in the Clint Eastwood film, Heartbreak Ridge. She played Diane Keaton's meddling mother in the 1996 comedy film The First Wives Club. Heckart was married to John Harrison Yankee, Jr. for 55 years from 1942 until his death in 1997. Her son Luke Yankee is the author of Just Outside the Spotlight: Growing Up with Eileen Heckart (ISBN 0-8230-7888-4), published by Back Stage Books in 2006. On December 31, 2001, Heckart died of lung cancer at her home in Norwalk, Connecticut at the age of 82. She was survived by her three children and her two stepsisters. 1 2 Pogrebin, Robin (2002-01-02). "Eileen Heckart, Oscar-Winning Actress, Is Dead at 82". The New York Times. New York City. Retrieved 2016-01-26. ↑ Jones, Kenneth; Simonson, Robert (2002-01-01). "Eileen Heckart, Gravel-Voiced Actress of 'Bad Seed' and 'Waverly Gallery', Dead at 82". New York City: Playbill. Retrieved 2016-01-26. ↑ "Awards Search: Eileen Heckart". Emmys.com. Television Academy. Retrieved 2016-01-26. ↑ "Justice". Classic TV Archive. Retrieved February 8, 2011.